Do you want to become more creative and more affective with your work? Would you like to increase your ability to focus on your goals for success? Are you looking to get the most out your mind and increase your brainpower? 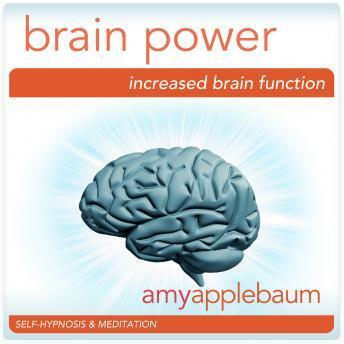 Tap into the unlimited power of your brain and be successful and accomplished with "Increase Your Brain Power" by Amy Applebaum. You have so much power and intelligence within you, and hypnosis and meditation can help you harness that power. Positive suggestions and binaural beats will be received by your mind, helping you to get more done in your day and increasing your focus and motivation towards achieving success. "Increase Your Brain Power" will help you adopt the positive beliefs and actions you must take to get the maximum usage from your brain and get you on the road to achieving success. Your brain is extremely flexible and capable. So, increase your brainpower today and start being more creative, affective, and successful!